I can’t help but laugh every time I see this clip from the 1987 movie Broadcast News. As a teenager, I was obsessed with this film. Aside from my desire to be Holly Hunter’s character, Jane Craig—the fearless, confident yet vulnerable, one-step-ahead-of-everyone-else news producer—I deeply connected to Albert Brooks’ Aaron Altman. He was second fiddle to cool, calm, and suave Tom Grunick, the handsome idiot newscaster played by William Hurt. While Aaron was smarter and more accomplished than his counterpart, when he got his big break—getting called up by the network to fill in on a Sunday night news broadcast—his classic meltdown induced the worst case of flop sweat in history, hilariously showcasing his severe lack of presence. 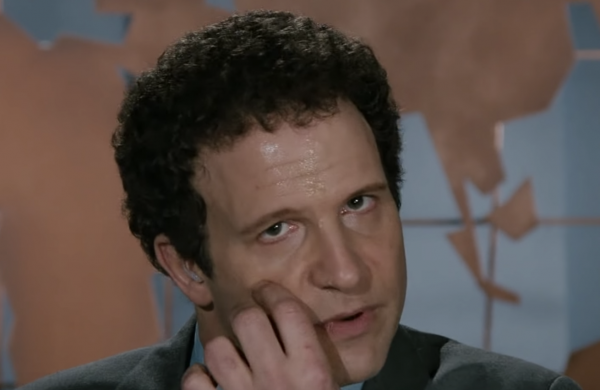 The reason why Aaron’s flop sweat scene was such comedic genius was far more than the talent of Albert Brooks or the brilliant writing of James L. Brooks. That scene resonated with the millions of viewers who have suffered stage fright or felt nauseous at the thought of having to speak in front of others, including, at the time, 20-year-old me. Yet what I failed to admit to myself is the real reason I wanted to be Holly Hunter’s Jane was because I was truly terrified at the thought of having to endure what Aaron did during that newscast. I was afraid to talk in front of anyone. That scene helped me characterize my own anxiety—I’d rather be behind the scenes than step into the spotlight for fear of failing. In the end, I never followed in the footsteps of Jane or Aaron but, instead, opted for a much less anxiety-inducing career in publishing. Ironically, however, I was often required to speak in front of others. Early on in my career, I knew I was in for some rough waters. In nearly any career, public speaking is inevitable. Whether sitting around the conference table sharing a project update or giving a presentation to the sales reps, I suffered from butterflies in my stomach, dry mouth, and an inexplicable memory loss that prevented me from finding the words I needed to say. I even dreaded talking on the phone. I was 10 years into my career when I had my quintessential Albert Brooks moment. Six months pregnant with my first child, I had to present to a group of sales reps, and it devolved into a panic-filled, sweaty debacle. Within minutes, I was far more focused on my fear and anxiety (and my self-consciousness about being extremely pregnant and extremely sweaty) than the important information I was there to present. Even more, I felt quite confident about the subject matter and didn’t think I would need to rely too heavily on the slides. But once the panic set in I could barely do more than read the bullet points and pray for the presentation to end. Despite my own struggles with confidence and the overwhelming sense of anxiety, I never doubted my desire to be a good speaker. In that darkened conference room, soaked in sweat, I reinforced to myself what I believed to be true: I was a terrible presenter. From that day forward, that moment in the conference room was the image burned in my brain whenever I was asked to present. Sound familiar? The fear of public speaking is a learned behavior. The anxiety many of us experience when communicating with others is fascinating to me. As young children we freely sing and dance, speaking to anyone who will listen. Most children have delightful and fearless qualities that mysteriously fade away late in elementary school. We learn about judgment and become much more aware that others are watching us critically. We are taught to be self-conscious and innately compare ourselves to others who appear more confident or comfortable. For example, in second grade I sang a solo in the school talent show. It feels other-worldly to think about that moment and I often wonder how I mustered up the courage given that I was relatively shy and my nervousness about speaking set in pretty early. It’s not like I was a talented singer either. It came down to one simple fact: I really wanted to do it. By the time I reached middle school, my days on the stage were behind me because I could not endure the fear associated with the scrutiny I would undoubtedly experience if I took the risk to perform. I quickly shifted gears and moved behind the stage. Despite my own struggles with confidence and the overwhelming sense of anxiety, I never doubted my desire to be a good speaker. I loved the idea of it and often watched others move gracefully around a stage while giving a keynote or deftly engaging an audience in a meeting. I desperately wanted to possess those skills. It seemed to me that everyone else recognized my lack of ability but, later in life, when I opened up about my fears, many of my colleagues and friends were surprised because their experience with me was vastly different. They observed confidence and self-possession. They never noticed the anxiety I thought I demonstrated, which is ultimately what prompted me to overcome my fears. The path forward: how I learned to communicate effectively. To say that I am grateful to have met my business partner would be the understatement of the century. One February morning in NYC we sat next to each other as new colleagues, waiting for a meeting to start. I was the newbie preoccupied with making sure I made a good impression. I was awash in anxiety and self-consciousness because I was surrounded by trainers and facilitators who were at the top of their game. I was walking into a surreal Kafkaesque nightmare that I had signed myself up for. At the time, I was making the leap into consulting and expected to work with clients behind the scenes. I never thought I would be the one delivering training or facilitating meetings. But, just like that little second grader, deep down I really wanted to do it. And my new colleague immediately caught wind of that. I am walking proof that there is life beyond the crippling fear of public speaking that many people experience. I am grateful for my experience and my ability to tap into the skills that were lying dormant, waiting to be harvested. Recently, I asked him what he observed on that first day and he summed it up simply by saying: “You were courageous.” I threw myself into the mix, battling the butterflies and the voices in my head telling me I wasn’t good enough. As I look back on that moment today, I recognize I didn’t possess all the right skills but I would have seen potential in that young woman, just as my partner did. Over the course of the next few years, I started getting coached by my then-colleague and now-partner, and learned that so much of what we struggle with is physiological or rooted in the weight we put on the situation. Let’s face it, public speaking won’t kill you. Sky diving will kill you if the parachute fails to open. That is a reasonable fear. The only way you are likely to die when public speaking is if you are doing it while jumping out of a plane and the chute malfunctions. Otherwise, you’ll likely survive. Today, when I coach others, I pay forward the valuable lessons I have learned. There are mechanics to dynamic communication. We need to train our bodies to use our gestures in certain ways, inflect with our voice, or find a set of eyes to speak to. Whether in a large presentation or small interactions, the skills are the same, and the more we understand how to use them, the more we can curb the anxiety. That is not to say I don’t feel nervous. Sure, if I walk onto stage with an audience of 1,000 people it will surely get my heart racing. The difference is I now understand how to manage those nerves. If I’m sweating, it’s usually because it’s hot in the room or I’m having a midlife hot flash, not because my nerves have gotten the best of me. I am walking proof that there is life beyond the crippling fear of public speaking that many people experience. I am grateful for my experience and my ability to tap into the skills that were lying dormant, waiting to be harvested. Now I relish every opportunity to stand up in front of a group and make a compelling presentation. I think everyone has a TED Talk inside of them, including me. I’m not yet sure what story I’ll tell, but I know it will include the road to becoming someone who would even consider getting up to tell my story. I’d love to hear your story and I encourage you to listen to our upcoming podcast episode about the science behind the fear of public speaking. Tell us your story using the form below.